The Flocon Dining Table by Naos Action Design, featuring beautiful oak top. The Flocon's two main tops are available in a variety of keramik finishes. The center extension is in clear glass. The base is crafted in precisely formed steel, artistically intertwined to create a show stopping design. 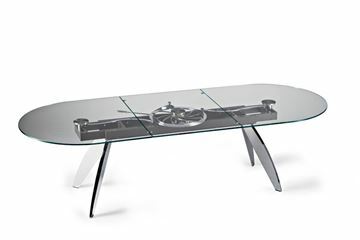 The synchronized mechanism harmoniously opens the table to an impressive 100". It is a remarkable design and truly as much a piece of fine art as it is an extremely well made, incredibly engineered dining table. You have the choice of a manual lever operated mechanism, or a battery operated motorized mechanism controlled with a wireless key-chain size remote. *If viewing on mobile device, images may show better by holding device horizontally. This video demonstrates the Quasar Dining table. However, this is the identical function for the Flocon Mechanism. Other finishes are available upon request. Please contact us for complete details. You can order as a manually operated mechanism, or with a remote controlled battery powered mechanism. 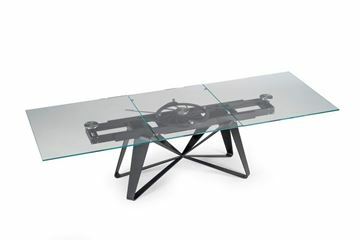 The motorized mechanism is a self contained unit affixed discretely to the undnerside of the table's steel frame. And the remote control for the system is small, easy enough to attach to a key chain. The battery charge lasts for quite a long time. To re-charge, you simply plug in the included charging cable until a small green light located on the side of the motor box turns on. "Thoughts move, a gaze moves, happiness moves. Life is movement. This is Action Design, an idea that follows movement and follows life. Action Design is imagination. Imagine a table precious like a jewel. Imagine a crystal surface, opening like a curtain and lighting up the scene. Imagine two circular surfaces, overlapping like an eclipse. Against all fixed ideas, Naos is imagination, transformation, satisfaction." The Quasar Oval Dining Table from Naos brings a stylish look to your dining area. 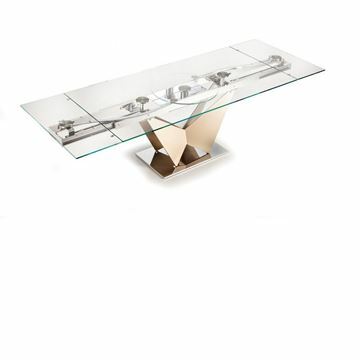 Sleek and modern, this table features extensible glass tops, and legs in stratified glass or in chromed steel and a synchronized mechanism for lateral extensions widening and automated central extension lifting. It is a remarkable design and truly as much a piece of fine art as it is an extremely well made, incredibly engineered, dining table. 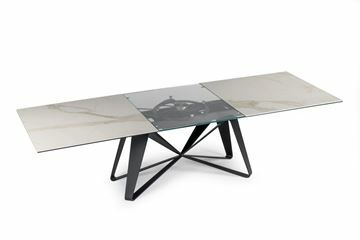 The Volare Dining Table from Naos brings a sophisticated and stylish look to your dining room. Please scroll lower for all the details. 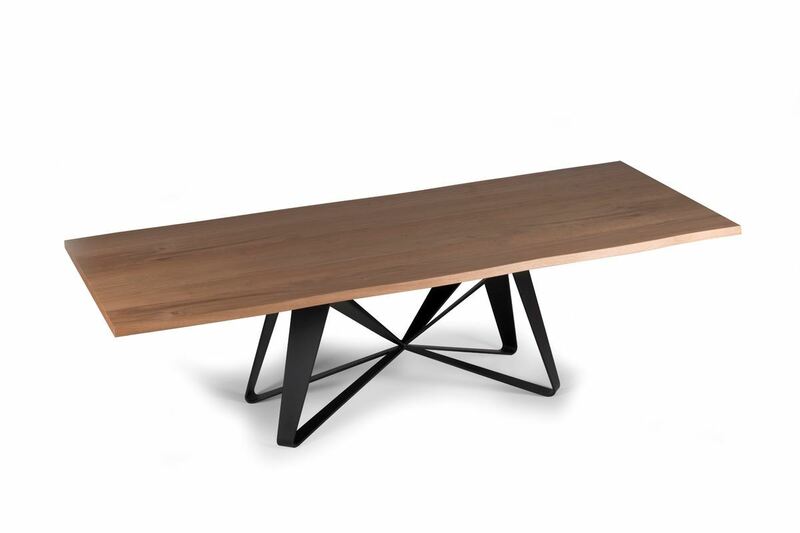 The Flocon Dining Table by Naos Action Design. The base is crafted in precisely formed steel, artistically intertwined to create a show stopping design. The synchronized mechanism harmoniously opens the table to an impressive 100". It is a remarkable design and truly as much a piece of fine art as it is an extremely well made, incredibly engineered dining table. You have the choice of a manual lever operated mechanism, or a battery operated motorized mechanism controlled with a wireless key-chain size remote. The Flocon Dining Table by Naos Action Design, featuring beautiful keramik top finishes. The Flocon's two main tops are available in a variety of keramik finishes. The center extension is in clear glass. The base is crafted in precisely formed steel, artistically intertwined to create a show stopping design. The synchronized mechanism harmoniously opens the table to an impressive 100". It is a remarkable design and truly as much a piece of fine art as it is an extremely well made, incredibly engineered dining table. You have the choice of a manual lever operated mechanism, or a battery operated motorized mechanism controlled with a wireless key-chain size remote.